The best dried fruits to eat are the ones that are the least processed and have no additives whatsoever, whether it’s plain sugar, food coloring or other elements meant to increase shelf life. The next condition is that they meet your individual nutritional requirements without negatively impacting any existing medical conditions such as a high fiber content would do for gastritis or high sugar content for diabetes. Dried apples, pears, goji berries, blueberries, aronia, raspberries, prunes and most dehydrated fruits are all healthy in their own way. At the same time, the processing some of them go through comes with side effects too, making them both good and bad for you. Which means not all dried fruits are actually that good to eat. First of all, what fruits are dry? You can actually dehydrate almost any fruit. Ideally, fruits with edible skin with a good pectin content lend themselves best to dehydration. The most popular dry fruits include: raisins, plums, apricots, peaches, figs, apples, pears, dates, coconut, goji berries, cranberries, cherries, sour cherries, mango, banana, pineapple, kiwifruit, papaya, blueberries and persimmons. Fruits with lots of tiny seeds can be dehydrated too, such as strawberries or raspberries, but the tougher the seeds, the less palatable the dehydrated fruit. Most nuts and seeds are also botanical fruits, or seeds of botanical fruits, which is why the term dried fruits is often used to refer to nuts and seeds that have been processed by reducing their moisture content. This means that almonds, walnuts, pistachios, pecan nuts, chestnuts, Brazil nuts, cashews or macadamia nuts can be considered dry fruits as well. Technically, all dried fruits, nuts and seeds are extremely healthy given their excellent nutritional status, antioxidant content and health benefits that come with these nutrients. But dried fruits doesn’t just mean dehydrated food products and often includes various processing methods such as sweetening with sugar products, artificial sweeteners or processed honey, salting, roasting using partially or totally hydrogenated oils or addition of chemicals meant to increase shelf life or enhance color. It’s actually this additional processing that makes a lot of dried fruit bad for you under certain conditions. 1) Apple chips. Because of how the fruit is naturally, it doesn’t require much processing to make it palatable. So many people love the chewy and crisp texture that is achieved only through drying, not to mention there are just as many unsweetened products as there are sweetened. Should anything be added, like cinnamon, honey mixes or inverted sugar or sulfur dioxide, it should say so clearly on the label so you can easily make an informed choice. Plus, you can tell since apple chips should taste relatively bland and just a little tart from the naturally-occurring malic acid. Pears can be prepared this way too and you can make them at home too. 2) Banana chips. The term refers strictly to dehydrated banana slices, without added sugars, sweeteners or other additives. Real dehydrated banana chips should be chewy, almost leathery in texture, similar to apple chips. The color should be less intense, brownish even and the taste sweet and savory with pregnant banana flavors and almost all the nutritional value of the fresh fruit, except for vitamin C. Healthy banana chips can also be baked. Extremely sweet, tough, dry chips are likely fried and contain added sweeteners (often coated in sugar), making them less healthy and not a good choice. 3) Sun-dried tangerine and orange peel, or chenpi. If citrus peel comes from organic agriculture, then it can make a relatively healthy dry fruit. While citrus peel doesn’t contain much vitamins or minerals, it’s rich in antioxidants and volatile oils which are beneficial for health. Sun-drying add to the benefits and so does the fact that the citrus peel is flavored and doesn’t usually require additives. 4) Sun-dried dates. They are easy to make and naturally sweet, containing 63.35 g of sugar per 100 g. Sun-drying reduced the moisture content, helping extend their shelf life. This contributes to a relatively natural product which concentrates important amounts of dietary minerals, antioxidants and some vitamins, notably vitamins B5 and B6, magnesium, potassium and the antioxidant manganese. 5) Dried figs already have plenty of sugar so there’s no need to add more, especially since drying concentrates it for an even sweeter flavor as well as prolongs shelf life. Often no color enhancing additives are added, as you can tell from the fact that most dried figs have a dull, brown color. So they are quite natural and, despite a moderately low nutritional content, they do have prominent health benefits such as relieving constipation and improving hemorrhoids symptoms or preventing hypoglycemia. 6) Dried persimmon (gotgam). What makes dried persimmon healthy is the fact they are dried naturally, without added sweeteners or other chemicals. Dried persimmons are a source of protein and rich in carbohydrates and dietary fiber, providing a boost in energy and constipation relief. 7) Unsalted, unroasted, unsweetened nuts and seeds. Nuts and seeds provide overall excellent amounts of dietary minerals, antioxidants and vitamins, more than almost all other foods. As long they are not roasted in oils, salted or sweetened to take away from their benefits, they are some of the healthiest dried foods. For example, Brazil nuts provide incredible amounts of selenium, almonds supply large amounts of vitamin E, vitamin B2, manganese, phosphorus and magnesium, walnuts have Omega-3 fatty acids and so on. 1) Sun-drying is the best method, although food dehydrators are alright too. 2) Look for any additives. The most common are sulfur dioxide (E220) and other sulfites. They are largely found in raisins, prunes, apricots, peaches and most candied fruits. The label shouldn’t contain any mention of these additives. 3) Avoid sweeteners like sugar, inverted sugars and substitutes like sorbitol, corn syrup or honey. For example, sorbitol is bad for anyone with digestive issues such as celiac disease and can cause flatulence, stomach upset, pain, diarrhea and other side effects and complications. The honey used is not even real honey, but either a blend of honeys of doubtful origin or a mix of some honey and corn syrup or other sweeteners (learn more about your favorite honey varieties). 4) Skip salted products and choose unsalted nuts, seeds or fruits. 5) Avoid anything roasted in oil or fried. The oils used are not healthy. The addition of honey or sugar to the roasting process can even lead to harmful byproducts with cancer-causing potential. 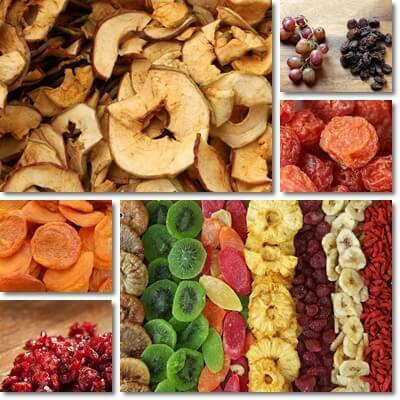 If you follow these guidelines, you can choose the best dried fruit to eat for you.